We’d love your help. Let us know what’s wrong with this preview of A Writer's Book of Days by Judy Reeves. To ask other readers questions about A Writer's Book of Days, please sign up. This book is a terrific source for writing prompts and a great book to give people who have just started writing. I carry this book with me everywhere I go. I teach people how to write books - novels, memoirs and works of non-fiction. Even writing teachers need help, and Judy Reeves provides perfect content for a writer's soul. I have found that most aspiring writers don't write - or even have a daily writing routine. This book helps you establish one. Filled with writing advice and writing insight, inspirational quotations and daily prompts, this is a book that every writer should own. I have more than 300 b I carry this book with me everywhere I go. I teach people how to write books - novels, memoirs and works of non-fiction. Even writing teachers need help, and Judy Reeves provides perfect content for a writer's soul. I have found that most aspiring writers don't write - or even have a daily writing routine. This book helps you establish one. I have more than 300 books on writing. There are only three that I take with me when I travel and this is one of them. "It's impossible to be a 'good girl' and a writer at the same time. When I was about 32, I decided to be a writer." This book was more beneficial than any other to my writing. It provides daily writing prompts for an entire year plus about a dozen extra for each month. Unlike numerous other writing prompt sort of books I've seen over the years, this one really struck well with me--the prompts coming in the form of a single descriptive sentence (some culled from writers/poets/artists work/sayings). The way I did it was to not look ahead to any given day and wait until I was ready to sit down, then look at the d This book was more beneficial than any other to my writing. It provides daily writing prompts for an entire year plus about a dozen extra for each month. Unlike numerous other writing prompt sort of books I've seen over the years, this one really struck well with me--the prompts coming in the form of a single descriptive sentence (some culled from writers/poets/artists work/sayings). The way I did it was to not look ahead to any given day and wait until I was ready to sit down, then look at the day's suggestion and write for at least twenty minutes (mostly 30-40). This is an awesome book ! I bought this for my kindle last year and I have been using a writing prompt every day. I like how it has 12 chapters, one for every month chock full of tips, hints, and fun stuff. and each chapter has writing prompts for every day of the month. I truly believe this book has kept me writing all year. I wish I had the tenacity to do every prompt. Alas, I am human. An awakening writing journey that lasts a whole year. Good exercise for new writers. If you love writing but struggle with motivation and constintency, this book is the one for you. The author is wise, positive and gentle. This book it the perfect push every writer needs to get the writing done, day after day. Seriously, if you like writing this book is a must have! If you want to be a writer, you have to write. You can’t just think about writing or dream that someday you may put words down on paper. You also can’t expect that you’ll sit down and in three weeks you’ll have the next great American novel. No, you have to write. A Writer’s Book of Days looks to create a writing habit. Writing needs to be done everyday, a regular writing appointment so to speak. Pen to paper. Write to write, not necessarily working on one particular piece but writing whatever ha If you want to be a writer, you have to write. You can’t just think about writing or dream that someday you may put words down on paper. You also can’t expect that you’ll sit down and in three weeks you’ll have the next great American novel. No, you have to write. A Writer’s Book of Days looks to create a writing habit. Writing needs to be done everyday, a regular writing appointment so to speak. Pen to paper. Write to write, not necessarily working on one particular piece but writing whatever happens to be on your mind, without editing or judgements. In the process, you will learn about how you write, your writing style, and what you have to say to the world. 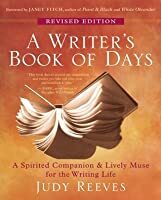 A Writer’s Book of Days is a wonderful resource for those dreaming of becoming a writer. It gives them a place to start and encourages them to practice and play with words. I think it also teaches them the important lesson that good writing comes in cycles and spurts. I would recommend this book to anyone interested in writing or starting with writing and looking for a means to spark his or her creativeness. This book introduced me to the concept of 'writing prompts' - short little sentences to use as starting points for short writing sessions. I started to use them and found that they bring out great creativeness and sometimes surprising results. Through writing prompts I've got to know characters of whose lurking presence I wasn't aware and I've delved into I would recommend this book to anyone interested in writing or starting with writing and looking for a means to spark his or her creativeness. This book introduced me to the concept of 'writing prompts' - short little sentences to use as starting points for short writing sessions. I started to use them and found that they bring out great creativeness and sometimes surprising results. Through writing prompts I've got to know characters of whose lurking presence I wasn't aware and I've delved into story types I would not have considered otherwise. All because you have to let the words come from the writing prompt when you show up to the paper. I enjoy the writing prompts and luckily there are enough in the book to keep you going for a long time. I enjoy doing them also as a means to switch from the everyday mind to the writer's mindset without having to produce right away. I'm not sure about this book. It's kind of dry and dull, causing me to skim-read a lot, yet it has a lot of good information in it at the same time. I found it a bit one big info dump, more so than most how-to writing books, which colored my perceptions, I guess. It didn't help that the author used the same words repetitively in both sentences and paragraphs. As well as the same advice over and over. It quickly got in my nerves. What I liked about the book, and why I bought it to begin with, is I'm not sure about this book. It's kind of dry and dull, causing me to skim-read a lot, yet it has a lot of good information in it at the same time. I found it a bit one big info dump, more so than most how-to writing books, which colored my perceptions, I guess. It didn't help that the author used the same words repetitively in both sentences and paragraphs. As well as the same advice over and over. It quickly got in my nerves. What I liked about the book, and why I bought it to begin with, is the prompts. I like them and intend to use them in my writing sessions. Overall though, the book really didn't dazzle me. My favorite and most trusted book on writing. I rely on this book every time I have a bout of writer’s block, and I love the fantastic writing prompts. The book is designed to inspire you, to get you writing every day, and to help you get past all the things that are holding you back from writing. An excellent book for writers. In addition to the year's worth of writing prompts, the book contains a plethora of valuable information on writing. You might find your muse right in this book as I found it to be a great motivational tool. A fantastic book for anyone wanting to stimulate their writing, I highly recommend this book. If you find it , keep it. Great prompts, advice, and technique. Absolutely love this book. I've thought many times that if I ever start a writing group I would use this as the workbook for it. Its filled with many great subjects to write upon, and lots of tips. I also love the quotes in it. I've read through this book, and now use it as a timely reference. A great read that provided much affirmation and many creative ideas for different aspects of writing using lively language and unique metaphors. Explores how to start, improve, and move forward with your writing and enjoy the journey. I have 58 books about writing on my shelf. Judy's Reeves' A Writer's Book of Days is #59. But it's not on my shelf. It's beside my bed, in my studio, in my car, out on the back deck - wherever and whenever I'm going to write, A Writer's Book of Days is with me. I love all of my writing books. They are inspiring and beautifully written just as you'd expect and hope a book about the writer's life would be. But Judy's book now has a special place in my heart as my #1 favourite writing book of all t I have 58 books about writing on my shelf. 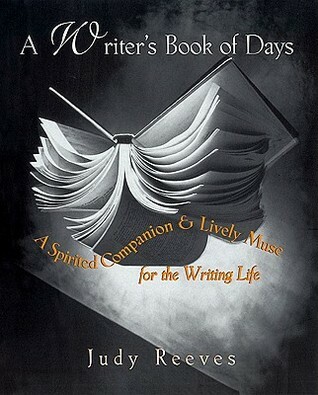 Judy's Reeves' A Writer's Book of Days is #59. But it's not on my shelf. It's beside my bed, in my studio, in my car, out on the back deck - wherever and whenever I'm going to write, A Writer's Book of Days is with me. I love all of my writing books. They are inspiring and beautifully written just as you'd expect and hope a book about the writer's life would be. But Judy's book now has a special place in my heart as my #1 favourite writing book of all time because it is inspiring, beautifully written, AND useful every single day of my life. I've read many other books of writing prompts where I embrace half of the prompts and shake my head over the other half, thinking who'd ever want to be bothered writing about that? 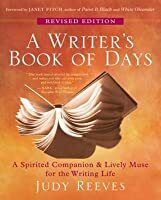 The Writer's Book of Days has prompts - one for each day plus a pile more in the prose on the page, and every single one of those prompts has value. This book is riveted between the lines of a true writer. I felt myself bleed whilst reading it, and I knew exactly what she meant. In fact, some days I failed to realize the foundations of my actions, but instantaneously I knew why I lit candles, took a shower with bath salts, and always prayed fervently without a cause. It's different; something sensual to be a writer. It comes like a light that you never wanted, but later you grew to appreciate it. It's the most beautiful and heart-rendering voice This book is riveted between the lines of a true writer. It's the most beautiful and heart-rendering voice you'll ever hear within yourself, and you'll be rewarded from your readers some day. "Prompts" were mostly so brief and vague that I couldn't get any traction. After awhile I figure out "prompts" were not what I need any more - I don't have trouble getting the pen to move. This book did get me to try pen and paper seriously for the first time in years, pointing out that it makes you slow down and you have a record of every change you've made, unlike the delete key. Other good thoughts here and there but not in the end very useful. This book is full of ideas and a daily writing prompt. The problem I had was that many days the writing prompt for that day was a little meaningless and prompted nothing but guilt for failing. When I switched it up and paged through the prompts to try whatever struck me regardless of the corresponding date, it freed me up again. A nice book with a lot of good nuggets. It is geared more towards writing practice than writing for publication, but if you are stuck on ideas for how to court the muse, this is a good place to look. I enjoyed all the little extra tidbits: advice from famous writers, historical notes, etc. Dit is het boek waar ik het idee van de schrijfveren (writing prompts) aan ontleend heb. Inspiratie voor een heel jaar schrijven. Er is ook een cursus schrijfveren! This is such a great book for those "in-between" times when you're not working on a project, or when you're stuck or when you just want to spend some time generating ideas or need encouragement for the writing life. Highly recommended! This book was recommended to me by someone in my old writing group...and I'm thankful! It was a great read, and a continous source of inspiration. I carry it with me often. The writing prompts and the more in-depth suggestions truly get you to the place where the muse comes out and plays! I have a weakness for books about journals, storytelling, and language, but they tend to all start to sound the same after a while. Judy Reeves manages to find ways to avoid repetition and keep her material engaging. This a nice book with some very practical advice for writers. I love the daily prompts. I think this book will stay on my currently reading list. I've attended free write sessions with Judy. She is a good teacher and a believer in writers helping writers.